Northmor’s Demetrius Johnson had a big day in his team’s 41-8 win over Fredericktown. The senior quarterback rushed for four touchdowns and passed for a fifth. Conan Becker carries the ball for Northmor in their dominating 41-8 performance against visiting Fredericktown. 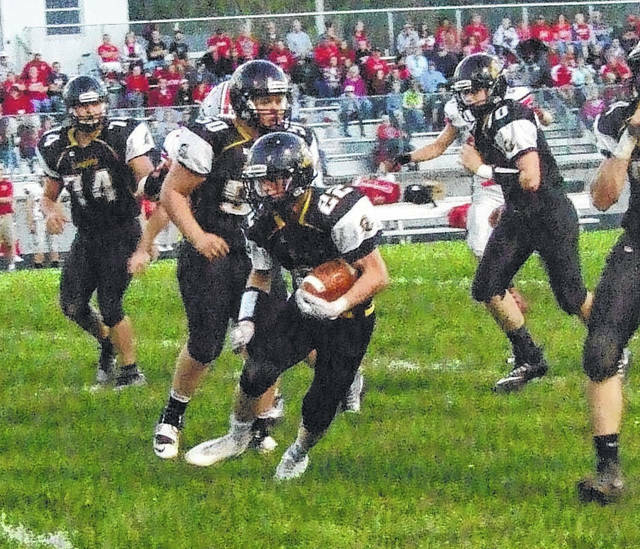 Northmor wasted no time in taking control of their home contest against Fredericktown on Friday night, setting the stage for the Knights to roll to a 41-8 victory and improve to 4-0 on the season. In their first league contest — a match-up against a squad that had beaten them 22-14 last year — the Knights immediately forced a three-and-out and got the ball on their own 39. After running for a short gain, quarterback Demetrius Johnson connected with Ryan Moore for a 10-yard gain. Two more rushes would net the team seven yards, but they would finish their drive in emphatic fashion, as Johnson took the snap and sprinted 42 yards for six points. Kyle Kegley added the extra point and Northmor led 7-0 at the 7:52 mark of the quarter. After that score, things snowballed as Northmor took hold of the momentum and didn’t let go. Fredericktown was able to get one first down on their next drive, but was forced to punt again. While the kick was a good one, pinning the Knights on their own 13, it still only took the locals three plays to score. Becker rushed for two yards and a personal foul against the Freddies moved the ball to the 30. After a four-yard scramble by Johnson, the senior quarterback went deep and connected with Conor Becker for a 66-yard touchdown. Kegley added the kick to make the score 14-0 with 4:43 left in the opening period. Armrose noted that while Johnson had shown a lot of skill running the ball throughout the non-conference part of the schedule, implementing more passing was one of his goals. After forcing another quick punt, Johnson went back to his running game, taking the first snap and scrambling for a 79-yard touchdown to put the Knights up 20-0. Things only got worse for the Freddies as they were stopped on a fake punt attempt on fourth down at their own 48. On the final play of the first quarter, Johnson scrambled for 32 yards. The second period then started with Conan Becker taking a handoff and running 16 yards for the score. Northmor added one more touchdown in the opening half. After getting another defensive stop, Johnson ran for two and 13 yards and Conan Becker added carries of 11 and 12 yards. After a holding penalty pushed the team back to their 28, Johnson hit Conor Becker for 23 yards. On the next play, the quarterback called his own number and darted the remaining five yards to give his team a 34-point lead entering the locker room. While his offense was putting up gaudy numbers in the first half, Armrose was just as pleased with his defense, which only gave up three first downs in the first 24 minutes of action. The second half was started with a running clock due to the 30-point margin. The Knights ensured it would stay a running clock by taking the opening possession 78 yards for seven points. A 24-yard run by Conan Becker started the drive and, after a pair of short runs, Johnson finished it with a 47-yard touchdown run. 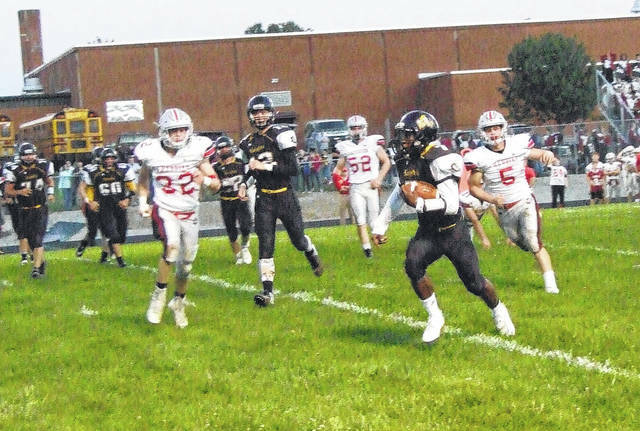 Fredericktown got a touchdown and two-point conversion in the fourth quarter, but could only get within a 33-point margin by the end of the game, as the Knights claimed victory in their first Knox Morrow Athletic Conference contest. After the team went 1-9 last year, Armrose noted that his players are quickly gaining confidence. And the coach knows his team will have to put in a lot of work this week to get ready for a road trip to Danville, a 2016 playoff team.